My diehard cookset for the past couple of years has been the Snow Peak Trek 900 in aluminum. It’s a wonderful little set that provides a 900ml pot with a lid that doubles as a small fry pan. The set weighs in at just 8.5 oz. It’s been very durable over various hikes and hasn’t given me a single problem. I’d be happy to buy it all over again if I had to. 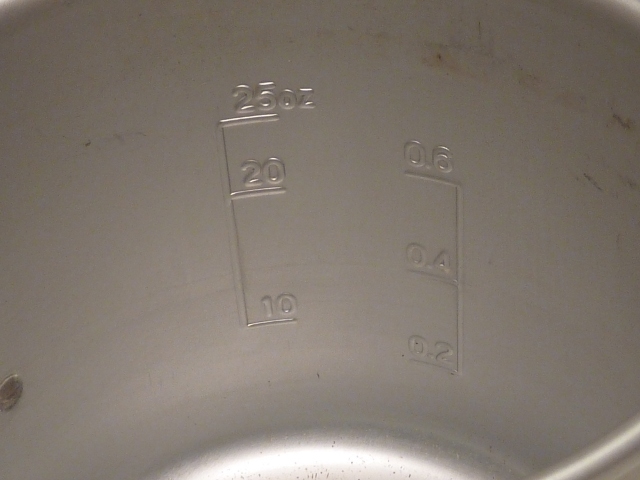 The inside of the pot is marked so it’s easy to know much water you’ve added. The only caveat is that it’s marked in milliliters. Just remember that .2 mL is about 1 cup and .4mL is 2 cups and you’ll be fine. 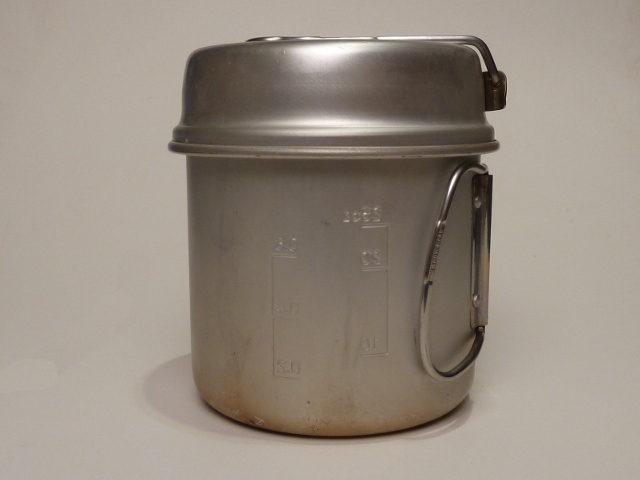 The pot has a 30 oz capacity. The fry pan is pretty small but I can attest that it will handle a Spam single if you cut it up. 🙂 That’s about all I’ve used it for and it works very well for that. Keep in mind that it’s plain aluminum. No non-stick surface here. So be prepared to clean it up right away. I usually just boil a little water to loosen up any stuck food. 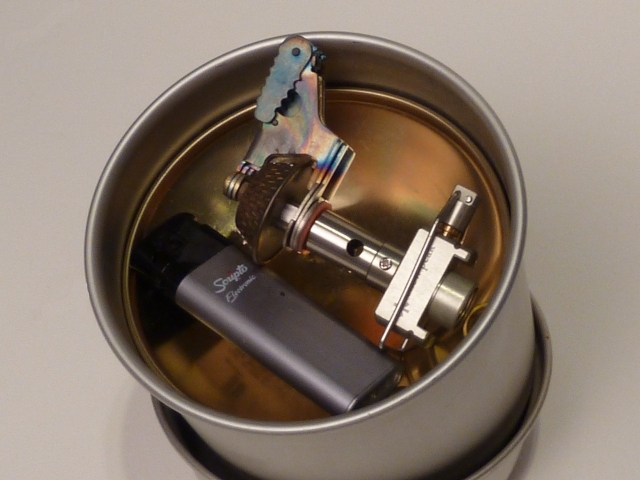 The pot easily stores the larger (8 oz) fuel canisters along with a small stove and lighter. Here you can see I’ve packed my Snow Peak LiteMax. If you want to carry the smaller (4 0z) canisters to save weight I recommend wrapping it with a handkerchief to keep it from rattling around. The lid doesn’t fit tightly which is good for general purpose but makes for a lot of noise rattling around in the pack. I ended up getting some garden “velcro” that’s used to secure plants to stakes. It works well and keeps the handle on the fry pan down as well. The stuff sack it comes is mesh and mine started coming apart at the seams. Overall this is a great little cookset and I highly recommend it if you’re looking for something that is fairly light and very durable. This is definitely a great solo set.